Calling all sweet tooths! Time to visit three delightfully delicious destinations in NYC: Dylan’s Candy Bar, Sprinkles Cupcake ATM, and Alice’s Teacup. So, channel your inner Augustus Gloop and dig in! This sinfully sweet candy shop is just steps from the 59th street subway station. You’ll know it when you see it — Dylan’s Candy Bar is the most colorful building on the block. On the first floor you’ll find bins of loose candy that you can scoop into cellophane bags, à la an old fashioned candy shoppe. Downstairs, on the basement level, you’ll find mostly prepackaged sweets and a glass case of gourmet chocolate. Last time I was at Dylan’s, there was a giant chocolate fondue fountain in the basement where you could purchase freshly dipped fruit. In addition to candy, the shop is brimming with candy-themed merchandise—clothes, dolls, plastic jewelry, toys, trinkets, you name it. I imagine that if you were to bring a small child to Dylan’s, you’d end up having to buy him a toy in addition to the candy. From my experience, most visitors don’t make it past the first floor (climbing stairs is hard when you’re weighed down with bags of candy) but if you do get the chance to visit Dylan’s Candy Bar, be sure to check out the upstairs. Ascend the candy-filled stairway to heaven: a combination ice cream parlor and a bar. That’s right, there’s a bar inside the candy shop. Dylan’s is essentially Willy Wonka’s chocolate factory with alcohol. 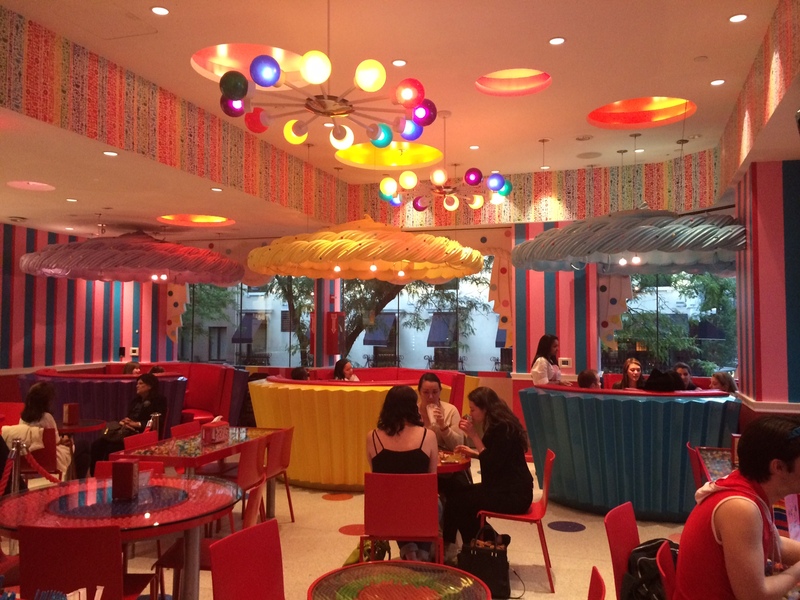 Enjoy an ice cream sundae while sitting inside one of the giant, cupcake-shaped booths. Then, wash it down with a candy-flavored mixed drink. One Wednesday in June I had the pleasure of attending a Mean Girls trivia night on the top floor of Dylan’s. Luckily, my friends and I reserved our table in advance, otherwise we wouldn’t have gotten in. 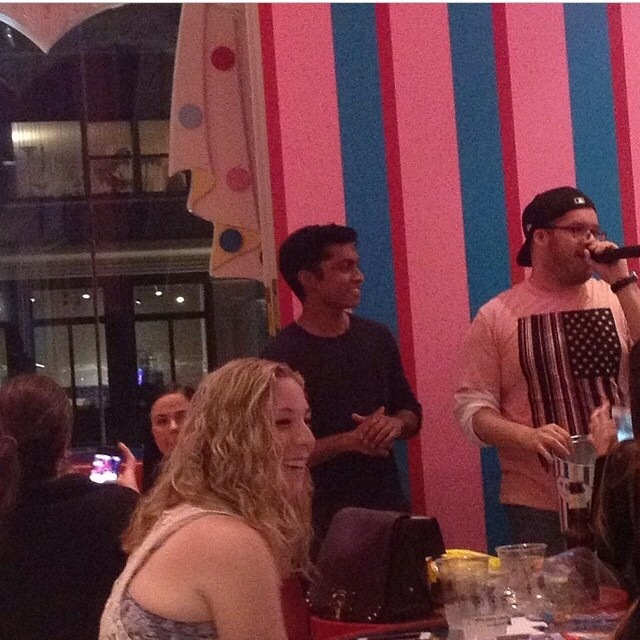 The place was packed with nearly two-dozen teams of pink-clad Mean Girls fans (because “On Wednesdays we wear pink.”) There was a surprise guest at the event: Mean Girls co-star Rajiv Surendra who played everyone’s favorite Mathlete Kevin Gnapoor. Sadly, he didn’t do his famous rap from the movie, but it was still exciting. My friends and I had a blast answering trivia questions while sipping our Mean Girls themed drinks. Overall, it was a really fun night! 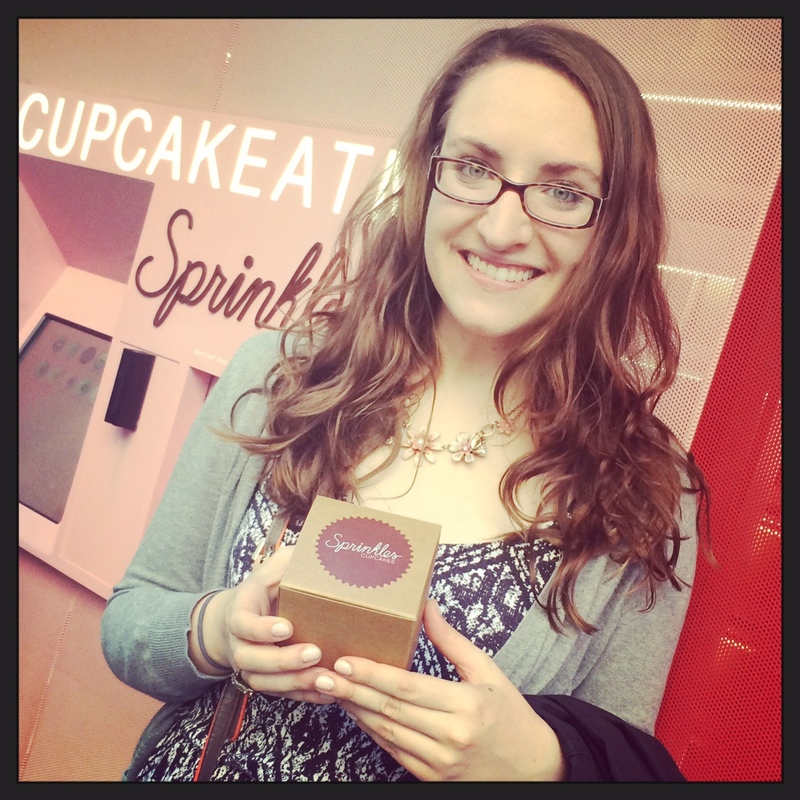 The next stop on this sweet journey is Sprinkles Cupcake ATM. That’s right, an ATM that dispenses cupcakes. (All in favor of instituting a cupcake-based currency, say “Aye!”) The Sprinkles Cupcake ATM is less than a block away from Dylan’s, so if you visit one of these sweet spots, you’ll definitely want to check out the other! This 24-hour ATM is located next to Sprinkles bakery and is constantly supplied with fresh cupcakes. Walk up to the frosting-pink ATM, make your cupcake selection, then watch your cupcake travel through the ATM and into your hand via the live-feed camera. The ATM tends to draw a crowd, so you might have to wait in a bit of a line, but it is definitely worth it. The cupcakes are delicious! Alice’ Teacup is an Alice In Wonderland-themed restaurant offering full English tea service. There are three locations throughout the city. I visited the one on the Upper West Side and had a lovely time celebrating my “un-birthday.” Alice’s Teacup can be rather pricey, so I would only recommend this spot for true Alice in Wonderland fans and/or tea aficionados. The menu has dozens of tea options and several tea service packages to choose from. My boyfriend and I split the “Tea Service for Two” which included two pots of tea, three scones, two sandwiches, and an assortment of cookies. It may not sound like much, but it was plenty of food and quite filling. We ordered one pot of Anna’s Earl Grey tea and another of the mint tea; original, pumpkin, and chocolate chip scones; a cucumber and humus sandwich and a roasted carrot sandwich. 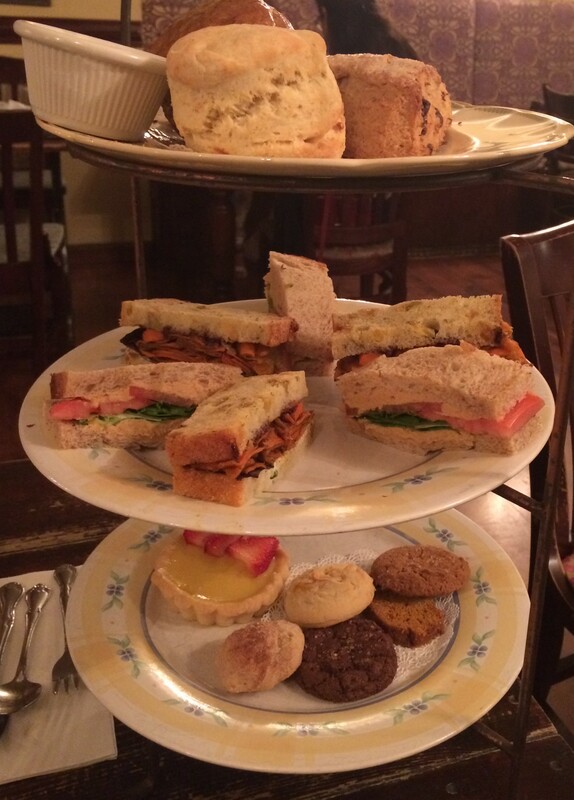 Each tea came in its own adorable teapot and the food was brought to us on a three-tiered serving tray. All the cups, dishes and saucers are mismatched which adds a bit of charm to the meal. You’ll definitely want to visit Alice’s Teacup for a cuppa if you find yourself in the city! Hope you enjoyed reading about these NYC sweet spots! Have you visited any of these delectable destinations?